HANOI, Vietnam, April 9, 2019 /PRNewswire/ -- French logistics and transport company FM Logistic will break ground tomorrow on its US$ 30 million warehouse and distribution centre in Bac Ninh, 20 km of Hanoi, to tap on the fast-growing outsourced logistics market in Vietnam. Once completed, the new multi-client facility will employ around 300 people and provide 52,000 sqm (560,000-square-foot) of storage space for up to 70,000 pallets. Completion of the first phase (21,000 sqm) is expected in spring 2020. The French ambassador to Vietnam, Bertrand Lortholary, is expected to attend the breaking ground ceremony. Among the customers interested in the Bac Ninh distribution centre is Brenntag, a global market leader in chemical distribution. "After one year of satisfying cooperation with FM Logistic in Bac Ninh, we have decided to expand this cooperation to temperature-controlled products. The new distribution centre will provide us with more space to absorb our important growth," says Vuong Le Minh, Supply Chain Senior Manager, Brenntag Vietnam. The demand for logistics is rising in Vietnam, one of the world's fastest growing economies with a GDP growth of 7% in 2018. The increasing domestic manufacturing, the rise in wages and consumption, the young population and booming e-commerce are also driving the Vietnamese logistics market. This presents opportunity for international 3PL companies providing value-added logistics services and last-mile delivery. "The Bac Ninh warehouse and distribution centre will support the development of food, retail, FMCG, industrial and cosmetics companies on the booming Vietnamese market. It will also increase FM Logistic's warehousing space in Vietnam almost tenfold, at a moment when class A-warehousing is in high demand. This testifies to our commitment to investing in Vietnam," says Hamza Harti, FM Logistic's country managing director for Vietnam. The facility has been designed by FM Logistic's sister company NG Concept to handle a wide range of items, including temperature-sensitive products, fast-moving consumer goods, electronic appliances, spare parts and hazardous products. Services offered at the warehouse will include storage (whatever the temperature requirement), handling, co-packing (or value added services, as they are called in Vietnam) and distribution. The flow optimization inside and outside the facility make it suitable for high-demanding modern retail operations. 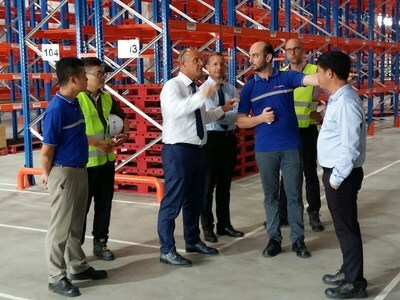 From May 2019, FM Logistic will also start operating a rented 6,500 sqm warehouse in An Phu, Binh Duong, less than 30km north of Ho Chi Minh City. The company started operations in Vietnam in August 2017. In 2018, it started providing nationwide transportation services, using a network of partners. Founded in France in 1967, FM Logistic is a family-owned independent logistics company with revenues of €1.2 billion in the fiscal year to March 2018, two-thirds of which made outside of France. It is active in 14 countries across Europe, Asia and Latin America and employs more than 26,000 people. NG CONCEPT, a subsidiary of FM Group, is a leading logistics real estate company with activities in 14 countries and 160 employees. The company's services cover project conception, land prospection, the receipt of regulatory approvals and the turnkey construction of logistics platforms. With safety and sustainability at its core, NG CONCEPT has built more than 2,500,000 sqm over the last 25 years. The company incorporates technologies such as BIM and augmented reality in building design. All its new buildings are LEED-certified. Brenntag is the global market leader in chemical distribution. The German based international company manages complex supply chains for chemical manufacturers and consumers by simplifying market access to thousands of products and services. Brenntag operates a global network with more than 580 locations in 73 countries. With its global workforce of more than 16,600 employees, the company generated sales of EUR 12.6 billion (USD 13.3 billion) in 2018.